So back in July, I did my first 'Week In Outfits' post and really enjoyed sharing more of my day-to-day outfits with you all. It's not the easiest of posts to do, however, because making time to get a photo in a morning before work is much easier said than done, and if I'm going out after work or straight to the gym, I just forget about taking a photo altogether. So I haven't made time to do one since! But I decided to plan a week to do it again, which was technically the last week of September but we're still going with October in the title because otherwise I look very slack and we don't want that, do we! Much a typical Sunday, I did the food shop and visited my Grandma, before heading into town for a little cinema trip (Mamma Mia 2 again, of course) and a visit to Pizza Express. Bold choice wearing white jeans to go for pizza but I (somehow) managed to not get a drop of tomato sauce on them! Go me! 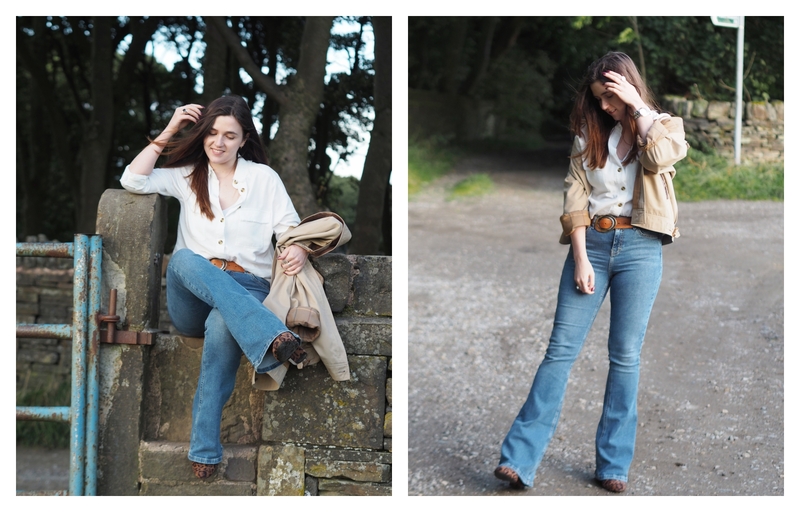 After falling further in love with Lily James in Mamma Mia, I dragged the flares out of my wardrobe and made them more office friendly with a simple white shirt, old brown belt and some leopard print boots. Fun fact: we went down the lanes by my home to get this shot after work and a dog walker was coming out of the field. We stopped to let him pass but he decided he needed to sit and catch his breath so just watched us instead. How bloody lovely. Ugh. 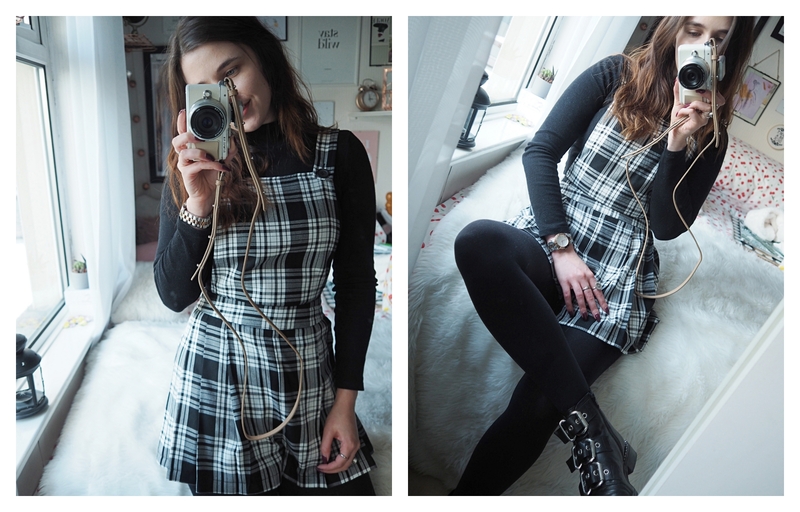 I found this playsuit in my wardrobe and realised that I hadn't worn it in months, so obviously that had to change! I went for a simple black and white look all round and it was FAR too windy to even attempt getting a picture outside. Wednesday was another wet and windy day, so I played it safe with another mirror selfie. I'm thinking of bring the mirror selfies back to instagram in a bid to enjoy it a bit more and make it less ~polished, if that makes sense? Anyway, stretchy trousers like these are perfect officewear for me and teaming yellow boots and jumper is just ideal, no? I'll bring my own sunshine kinda vibes. For some reason, I thought the top of a hill would be a great place to take an outfit picture on a rather blustery day? The views are good but not the view of me with hair in my face! Anyway, who else is loving cords this season? These are actually from last year when I found them in the Zara sale, but I have refound my love for them and want everything corduroy now! I actually had the day off on Friday and it's actually when I went to Tropical World to shoot the photos for my latest Sustainable Series post! So you should've already seen this outfit, meaning I don't need to talk more about it? I will say though that these jeans are just as uncomfortable as they look. Especially for sitting down for long periods of time, eek. Saturdays are usually my 'do something fun' day, but on this occasion it was more of a 'get things done around the house' day. So I went for the comfiest jumpsuit ever paired with my new favourite baker boy hat for a trip to the farm shop, a few hours of ironing and some baking. I'm a big fan of a baker boy and a big fan of tartan so combining the two is the dream! Which outfit is your favourite then? I'd have to say Saturday for comfort or Sunday for style!